Flexible packaging major, Uflex, showcased its latest state-of-the-art aseptic filling machine - ASEPTO Smart 78 at PackEx India 2017, Pragati Maidan from 21st to 23rd August 2017. 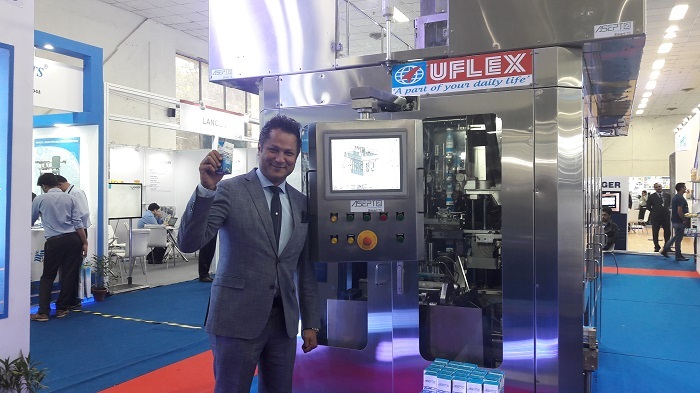 ASEPTO Smart 78 is the first of its kind Aseptic Packaging machine to be introduced by UFLEX - the leading packaging and printing player in the country. This is a pivotal step by Uflex in enabling the Hon’ble PM’s Make-in-India vision. As a part of expansion strategy, Uflex has forayed into the aseptic packaging solution under the brand name - ASEPTO. Featuring a six layered packaging innovation, ASEPTO is made of paperboard, aluminium, and poly-ethylene to keep the products’ freshness and nutritional value preserved along with the increased shelf life. Uflex manufactures the packaging solution through ASEPTO Smart 78 - the advanced machine which has a capacity of 7,800 packages per hour for pack sizes ranging from 100 ml, 125 ml, 160 ml and 200 ml slim packs. The machine comes with special tools for operation and maintenance of the machine. It has several other features such as advanced integration with PLC, less electronic parts, operational friendly and has the highest speed limits than any in its category. UFLEX Ltd. is the first Indian Manufacturers of Aseptic Liquid Carton Packaging in India offering user convenience, easy opening and optimal shelf life packaging for Juice, Dairy and Alcoholic Beverages. A reliable manufacturer from the house of Uflex, backed by 30years of experience in the business of Flexible Packaging. Uflex enjoys a global reach with unhindered speed making it truly multinational, Headquartered in Noida, it has state-of the-art manufacturing facilities in India, UAE, Mexico, Poland, Egypt and USA and spanning over 140 countries since 1983. Uflex manufacturing facilities enjoy ISO 9001, ISO 14001, HACCP & BRC accreditations and its products are approved by FDA and BGA. It is also a part of the D&B Global Database and winner of various prestigious national and international awards. Uflex has been awarded with FPA and AIMCAL Awards along with the ‘World’s Greatest Brand Asia and GCC 2015, CII Industrial Innovation Award 2015 and the Seal of Gold for Product Excellence by the World Consulting & Research Corporation International.